Want to get fit? We round up Battambang’s fitness options, from gyms and yoga to swimming and cycling, plus some local options including aerobics and sports. There are a number of gyms around town as well; they are low-cost but with have a wide range of quality and facilities. The main Western-style gym in Battambang is at the Classy Hotel for $5 and long-term memberships may be negotiable. The gym is surprisingly well-equipped, featuring several cardio machines, free weights, bench press, Smith machine, and several other bits and bobs, including exercise balls. The owner lived abroad and is interested in fitness, so even though it’s small, it’s a great hotel gym. 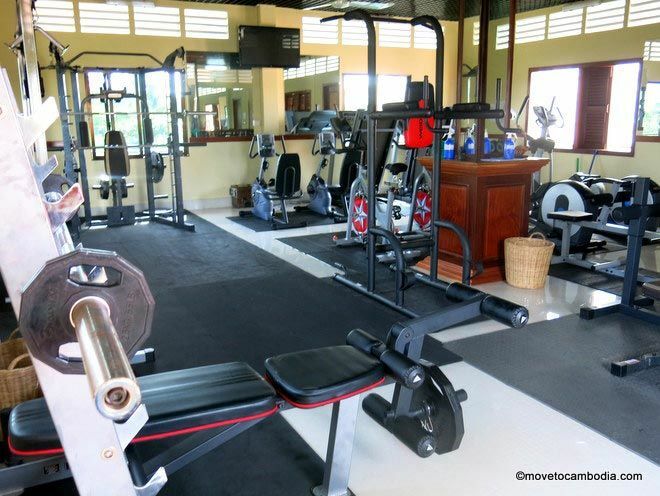 Surprisingly well equipped, the Classy Hotel gym is one of the best in Battambang. The most highly recommended Khmer-style gyms are on Road 1 near the junction for the Wat Sangker bridge and on Road 3 near the Chaya apartments. The cost is a couple thousand riel per visit and you do not need a membership. Take a stroll down to the banks of the Sangker River at dawn or dusk and you will be intoxicated by the culture and community spirit that culminates. Whether running, walking, or making the most of the permanent work-out machines, there is no shortage of activities to help you keep fit. The best part about choosing this option, other than that it won’t cost you a single riel, is that you also get a great opportunity to interact with the locals. Additionally, dance workout groups run 6 to 7 a.m. and 5 to 7 p.m. on the Wat Sangker side of the river, offering low-cost (1000 riel) aerobic exercise groups with a really fun and social vibe. Around the Victory Club on Road 1 just past the pedestrian bridge, groups of locals get together after work to play volleyball and basketball matches among other sports, offering another great way to get in shape while mixing with the local community. Battambang and its surrounds also offer a unique cyclist’s paradise — with flat roads and quiet yet beautiful country routes, it is a great way to explore while keeping healthy. Heading out towards Wat Kor is one recommended route, north to Ek Phnom another, and for the more adventurous, all the way out to Wat Banan (40km round-trip). Please remember to carry sunscreen and lots of water! 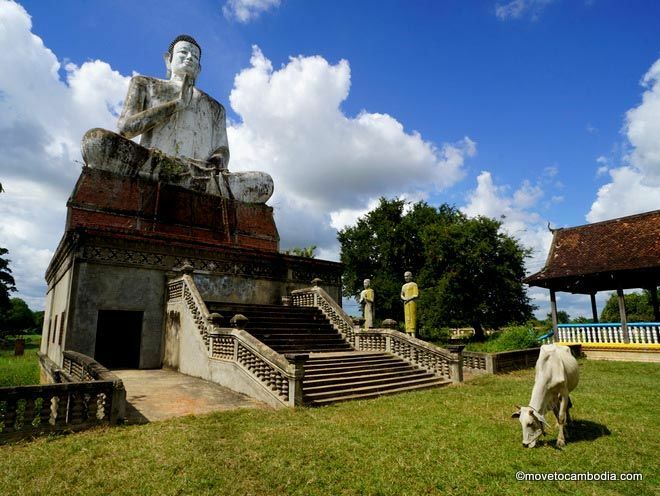 For more details, read our post about cycling the Battambang countryside. Just $3 per visit, the pool at Delux Villa is perfect for swimming laps. It won’t take you long to work up a sweat in the Battambang temperatures, so a preferable choice might be to take a dip at one of the local hotel pools, many of which offer low cost day passes. 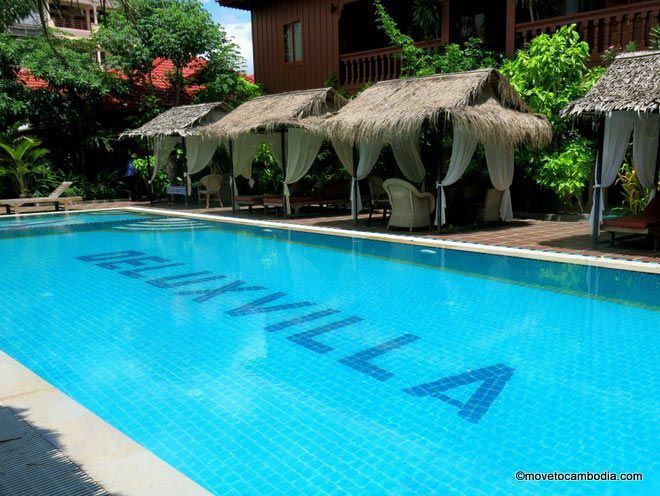 Delux Villa ($3) has a decent sized (around 15 meter) pool for swimming lengths. Slightly more expensive, Classy Hotel on the banks of the river, has a larger pool at $5 a splash. Priority is given to hotel guests and the waters may get busier during peak afternoon hours, but for a morning or evening dip they could be a good choice. Stretch out and relax at Here Be Dragons hostel’s bi-weekly yoga classes which are held Tuesdays and Thursdays at 6:30 p.m. on the roof. Head up to the terrace a few minutes before to grab a spot and a mat (available to borrow), classes cost just $2. FitnessBTB is a new gym offering small-group fitness classes from qualified CrossFit trainers. Classes have eight participants or fewer and are either ‘boot camp,’ which is an foundation course that offers an eight-week introduction to functional fitness, or ‘strength and conditioning,’ for those with previous CrossFit experience. They also have yoga classes and open gym time. The cost is $35 a month or $3 for a drop-in boot camp class or $5 for a drop-in strength and conditioning class. They also offer a free fitness assessment for prospective members. Pool and gym hours: 6 a.m. to 9 p.m. Looking for more? 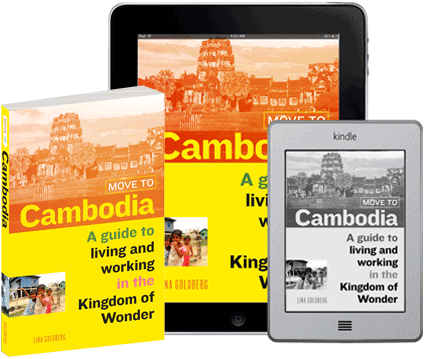 View the full Battambang city guide for tips on where to stay, what to eat, and things to see and do.